Here’s a fact baseball fans – and probably plenty of media types or even scouts – across America haven’t a clue about: Jon Gray is one hell of a pitcher. Gray’s name won’t pop up near the top of many MLB statistical lists. When the season is over, his record won’t flirt with 20 wins; he’ll be lucky to haul in a dozen. His command performances will not be seen on SportsCenter. But make no mistake, Gray is one of the best young pitchers in baseball. Gray’s 4.33 ERA is reflective of a decent Rockies pitcher, but (combined with his uninspiring 5-4 record) it doesn’t tell the whole story. Gray has vastly improved from the pitcher he was a year ago. As Denver Post beat writer Patrick Saunders recently pointed out, the Rockies second-year man now has full command of four pitches. He’s bordering on a workhorse now, too. Since May, Gray has had 14 starts. He’s made it six innings or more 12 times (against the Yankees he was cruising until he experienced fatigue and soreness in the fourth, when he was pulled). He’s pitched seven innings six different times. That ERA is inflated by just a couple of bad outings early in the season (he gave up nine against the Cardinals on May 19 and six when Arizona came to Coors Field for his second start of the season). In his last 10 starts, his ERA is 3.11. When Gray is on, he’s virtually unhittable. His 103 strikeouts begin to prove that, providing tangible evidence of what he’s become. But damn the poor guy is unlucky. Gray has had 16 starts, and in seven them – games in which he’s given up three or fewer runs – he’s racked up three losses and four no-decisions. In those games, if the bullpen didn’t screw around and waste Gray’s outstanding performance, a bunch of ice cold bats did. Three runs? That’s not asking a lot from what’s supposed to be one of the best hitting lineups in all of baseball. 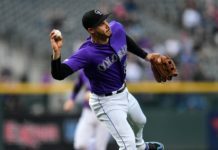 The Rockies have quite literally squandered seven wins – for the team, and for Gray. Sunday was a perfect example. Gray pitched seven scoreless innings, striking out eight. Once he was finally relieved, at 115 pitches (a career high) and with the score tied at zero, nobody helped him out. The Rox couldn’t score a single run. In the ninth, Gonzalez Germen gave up a walkoff single, giving Gray yet another no decision. 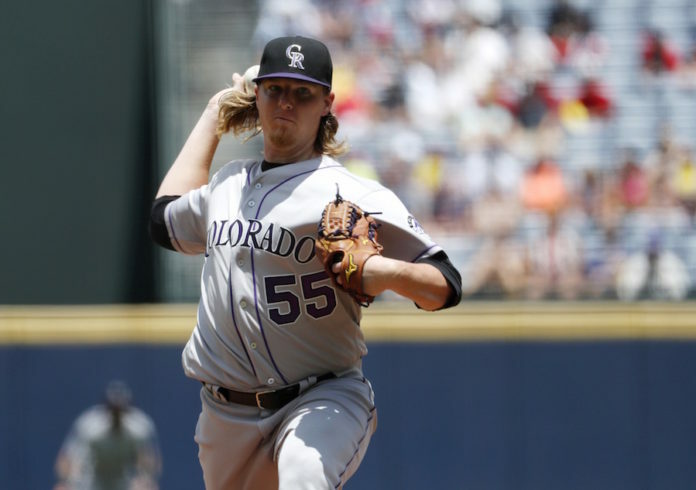 Gray isn’t the only Rockies hurler who’s fallen victim to tough luck outings. It happens to every pitcher on every team, but not quite like it’s affected Rockies starters this season. The Rox have 12 blown saves, good for ninth most in the majors. At the top of the rotation, Chad Bettis has seven starts in which he’s allowed four or fewer earned runs that have resulted in three losses and four no-decisions. Tyler Chatwood, who leads the team in ERA at 3.29, has three starts in which he’s allowed three runs that resulted in three losses. 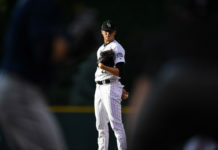 Tyler Anderson is beginning to understand what it’s like to be a Rockies starter. In his first seven big league starts, his ERA is an impressive 3.43. On Monday night he allowed more than three runs for the first time ever, but his record is 2-3 with two no-decisions. Since June 14, Jorge De La Rosa has looked like his old self. In his last three starts, however, he’s just 1-2 – even though he’s averaged 6.2 innings and given up only seven total earned runs. In Major League Baseball there are no guarantees that come along with “quality starts,” but the rough math suggests there are at least 20 games that have slipped away from the Rockies – but more importantly, they’ve slipped away from their best starters. Convert even a quarter of those to wins and the Rockies are above .500 on the season. Rockies GM Jeff Bridich has done a solid job in a relatively short amount of time to establish a fairly respectable starting rotation. Unlike previous seasons, the Rockies have five legitimate starters. But there’s still work to do in the bullpen, and the daily lineup has to hit when it counts. All those losses that come with three or fewer runs given up by the starter? Consider that the Rox strand 3.43 runners in scoring position per game; that number jumps to 4.14 at home. Jon Gray is set to be in a Rockies uniform through 2021. That’s the good news. But the challenge between now and then? Turn those quality starts into wins. Because if he continues to pitch this well – even without the wins – he won’t be a secret, nor will he be happy.